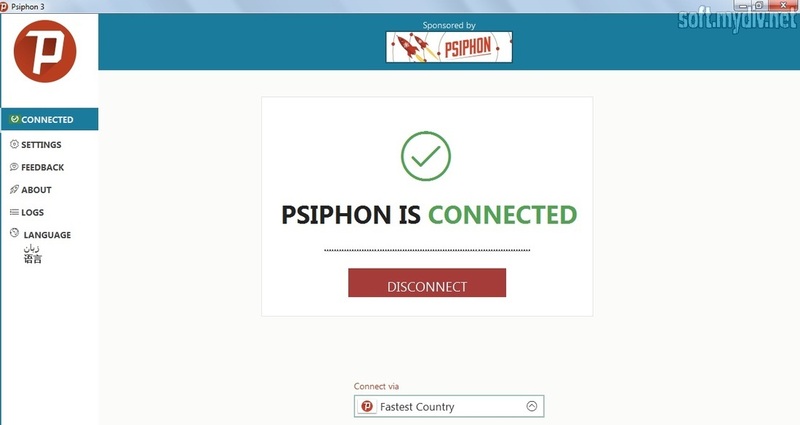 Psiphon is a small utility that lets to connect to VPN server instantly. 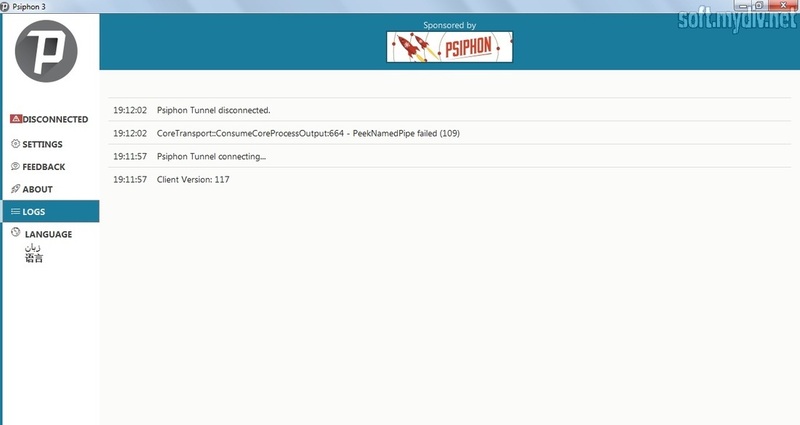 It is the fully VPN client that allows you to visit websites which were banned by your local Internet providers. The program supports HTTP/SSH/SSH+ protocols and simplifies web surfing. Plus, all your actions are logging during the network session, and you can view reports anytime. You should know that the app doesn’t require installation. You can launch it after downloading the executive file. When you run the app, you will discover a screen with a large button. 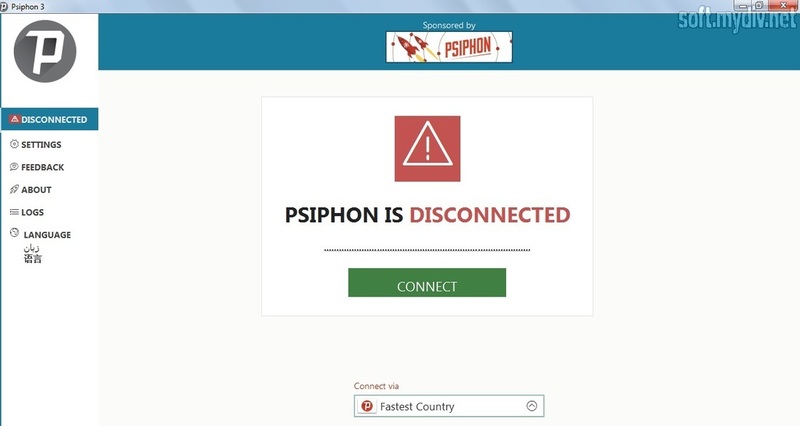 You should push Connect to activate the VPN network. Also, you can choose the fastest country or another one from the bottom form. It depends on your network speed. If you are not sure what to choose, you have to pick Fastest Country. Besides, there are 7 tabs in the left column: Connection, Settings, Feedback, About, Logs, and Language. If you need to view VPN session recordings, you have to open Logs. To send a bug report, use Feedback tab. If you need to get advanced options, you should click on Settings. 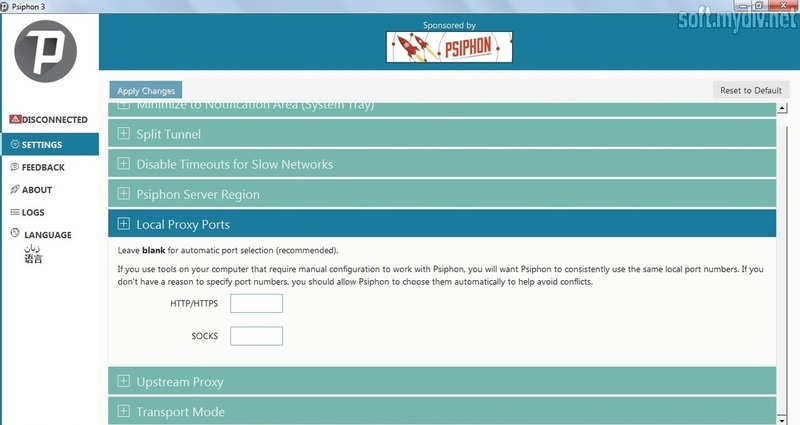 Psiphon is a cross-platform, open source project that aims to grant open access to the Internet for everyone. The algorithm of the program is similar to a standard proxy server that masks your network session. If you want to visit a website which was blocked in your country, then this program will help you to pass through censorship and resource bans. Despite it doesn’t guarantee anonymous status, this software provides a reliable and secure method of web surfing without access troubleshooting. Breakthrough the network barriers and censorship. You don't need to install the program.